The IDEAL STEEL Hybrid has a record 82% EPA tested efficiency and average emissions of 1.04 gm/hr. It will easily burn 12-14 hours, and will heat large areas comfortably. It’s high efficiency means that it will produce up to 131,000 more BTUs per day than a standard non-catalytic stove. 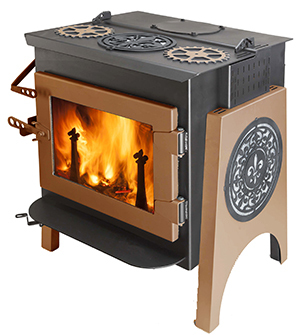 Geared to you Designs at http://www.woodstove.com/geared-2u-design-book • Crated Dimensions: 41"H x 32"W x 28"D Call 1-800-866-4344 for a freight quote. NOTE: To receive the discount for "The Works", you must add the options to your order first!